Growing up in Birmingham, Kimberly Kirklin had first-hand experience with both the world of the arts and the world of medicine. Journal file photo. 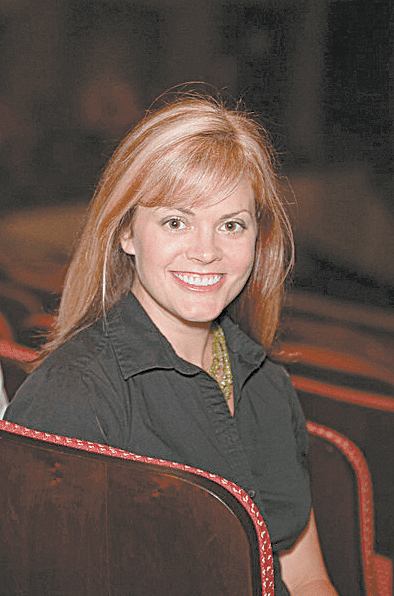 Six years ago, Kimberly Kirklin took a big leap with the Alys Stephens Performing Arts Center and led a pilot program to take arts programming to patients by establishing UAB Arts in Medicine. Unlike clinical art therapy programs, which are conducted to achieve a medical outcome, Arts in Medicine takes fine arts activities to patients for their personal wellness. Growing up in Birmingham, Kirklin had first-hand experience with both the world of the arts and the world of medicine. Her father, Dr. James K. Kirklin, is a world-renowned cardiothoracic surgeon known for his work in heart transplantation. Therefore, medicine was a part of life growing up. So, too, were the arts, which Kirklin embraced at the young age of 3 when her mother started her in violin lessons. She transitioned through different instruments and art mediums before committing to her love of musical theater while attending the Indian Springs Schools. From there, she pursued a musical theater degree at the University of Miami, making her way to New York for a time before switching gears and returning to Birmingham to work in arts education and outreach. It was a natural next step for her to take those programs from a kid in a classroom to a patient in a hospital. “So, I started to research it and realized that this is a real field,” Kirklin said. She went to the University of Florida to obtain a master’s degree in arts in medicine and used what she learned to launch what has become UAB Arts in Medicine. After extensive research, the center launched its first arts in wellness program for the elderly, now dubbed the Aging Creatively program. 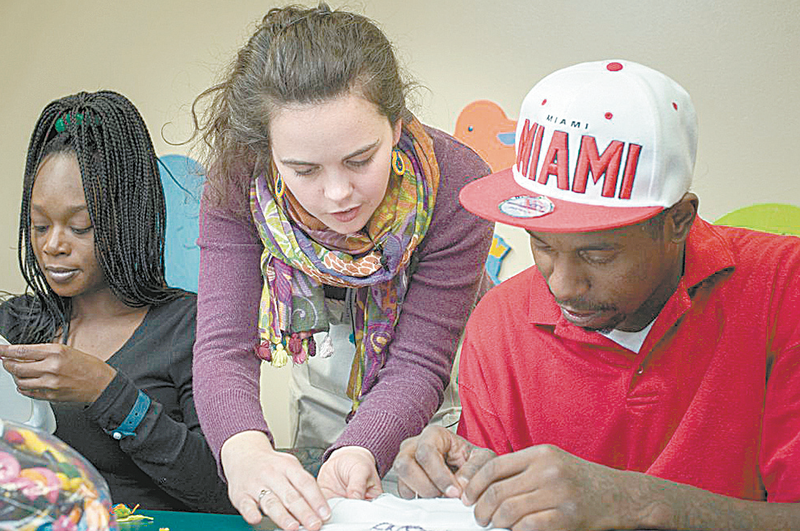 Through the first program, Kirklin and the ASC saw support systems forming among program participants as a byproduct of doing art projects together. The results were enough of a success to launch an expanded Arts in Medicine pilot program in 2013, partnering with UAB Hospital. The UAB Arts in Medicine program now has its own office space in the hospital, where it rolls out close to 100 hours of arts services each week. Program offerings range from taking packets of paints and coloring pages to a patient, to leading group dance classes, to hosting a musical performance in the hospital’s atrium. Helene Taylor, a visual artist, often brings in community canvases. She will draw an image outline on a blank canvas, post it somewhere in the hospital and allow passersby to take a few moments to paint. A great group activity has been Lillis Taylor’s (above center) textile design classes for parents in high-risk pregnancies. The parents can create and embroider pillows for their newborns. Photo courtesy UAB. A great group activity has been Lillis Taylor’s textile design classes for parents in high-risk pregnancies. The parents can create and embroider pillows for their newborns. Elizabeth Vander Kamp is a storyteller and leads movement activities. Her storytelling is great for bone marrow transplant patients, Kirklin said, who often are very low on energy during their treatment. Visual arts and meditation guide Kim McKenzie works frequently with patients in the center for psychiatric medicine. One of her approaches is to have patients paint with their hands, making big sweeps of color on the canvas. The institute also brings in special programming at times. For the second year, AIM will host a summer magic camp for pediatric patients with hemiplegia, a weakness on one side of the body as a result of cerebral palsy, stroke or other traumatic brain injury. After six years of piloting, perfecting and expanding the programming, Kirklin said the next phase for AIM is to reach farther outside of hospital walls. The team already has a partnership with Children’s, the Exceptional Foundation and the Collate Jewish Family Services’ Cares program. Most recently, a dance therapy class was added to the calendar, held at the Dance Foundation for people with Parkinson’s Disease. “We are really interested in researching and adding to the literature about arts in wellness,” Kirklin said. The program is conducting two studies, one with Kamp and bone marrow transplant patients and another with Taylor’s work in high-risk obstetrics. There is more and more research to be found on the benefits of arts in medicine programs, Kirklin said. She recently attended an arts in medicine conference in the United Kingdom and noticed how widely the concept is accepted and implemented throughout the country. She’s hoping to see that same result spread throughout the United States. “The arts and medicine are two worlds that fit so well together, but you don’t always think they do,” she said.